The Element is the point at which natural talent meets personal passion. When people arrive at the Element, they feel most themselves, most inspired and achieve at their highest levels. 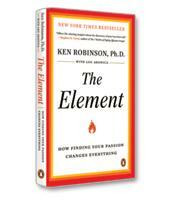 In The Element, learning expert Ken Robinson, Ph.D., draws on the stories of a wide range of artists, athletes, scientists, business leaders, academics and others to show you why finding your Element is essential for all of us. He also explores the conditions that lead us to live lives that are filled with passion, confidence and personal achievement. How to unleash the powerful driving force inside every human being. The key to the breathtaking diversity of human talent and passion, and to our extraordinary potential for growth and development. How to make any vision, any dream, a reality. How to find the place where your talents and desires intersect.